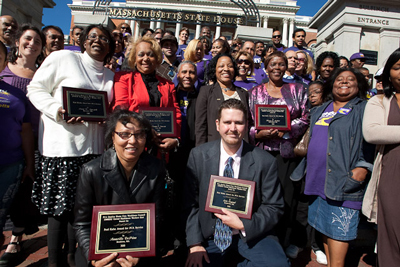 Starting in 2010, the PCA Workforce Council and 1199 SEIU recognize five PCA's from different regions of the Commonwealth with an award for their dedication to their work and their employers. The PCAs are nominated by their consumer/employers or human services agency staff. Health and Human Services Secretary JudyAnn Bigby presented the awards to Rosa Amegah, Worcester, Amarilis DePina, Brockton, Maria Garcia, Lynn, Mary Ketter, East Boston and Eric Osgood from Bondsville (recipients pictured below). Scroll down to read profiles about each winner. Ms. Amegah’s reputation is such that she was nominated by three separate individuals. A Worcester native, Rosa is an L.P.N. she has worked as a PCA for thirty years. Regarding her PCA work, Rosa said: “It is not about the money. It is about the caring and being there for a person in need.” One of the letters of nomination was from the wife of one of Rosa’s consumer/employer and spoke of how Rosa assessed him from head to toe and informed her of his physical problems and needs. Rosa also provided assistance with program paperwork. Rosa serves as a delegate for the PCA union and, as such, is an important link in connecting hundreds of PCAs working in the Worcester area. Ms. DePina, who has been working as a PCA for five years, has worked as a Certified Nursing Assistant for more than twenty years. Amarilis was working at a rehabilitation facility when she met the Susan, woman for whom she now works as a PCA. In her nomination letter, Susan said “She has come in bad snow, ice, rain or wind storms. …Even when her husband passed away unexpectedly … she found coverage to take care of me… ". Ms. Garcia, who came to the U.S from the Dominican Republic when she was 12, has lived in Lynn since 1972. She has been a PCA for ten years and was nominated by Laura, the surrogate for Janet, the consumer Maria works for. In her letter Laura said, “Maria …does not think twice about giving up her weekend or working hours that are not … going to be paid. … (Maria) is not only Janet’s PCA but her friend. She takes Janet out shopping and to Friendly’s for her birthday… ". Ms. Ketter says that: “PCA work is very hard but getting to know my employer on a personal level is very rewarding. I love this job.” Linda, the employer who nominated Mary said : “ (Mary) started working for me several years after she moved here from Kenya. Mary learned to perform my complicated care with an expertise … that I had never before witnessed. … Mary also provides valuable insights regarding my medical problems to my health care providers. She coordinates my home health care program (and) trains new PCAs in the complex aspects of my daily care." Mr. Osgood was nominated by Judy Sherman, a service coordinator of the Dept. of Developmental Services. She came to know Eric through his work at Community Options. Eric worked as a mentor with Scott, offering vocational supports in a school to work program. When Scott graduated, became employed and moved into his own apartment, Eric became his PCA and later his roommate. As Ms. Sherman said in her letter:” Eric opened up his world to Scott, introducing him to his son … and a new array of friends … .” Over the past six years Eric has been an integral part of Scott’s world, respectfully attending to his myriad emotional and physical needs. In so doing Eric has helped a young man to gain success, maturity and greater independence.